I posted recently about some redecorating we've been doing in our living room and kitchen. As I mentioned, we live in a rented flat so the changes we can make are mainly aesthetic - buying soft furnishings like cushions, curtains and candles etc, rather than painting or changing the carpets. It's also a furnished flat so the majority of the furniture isn't ours. If I had my own way though our next task would be replacing our sofa as it's starting to feel really old - the leather is wearing away in places as is the padding on the inside, particularly on the arms where you can really feel the wooden frame. Not the best for lounging on! My ultimate dream living room would definitely include a corner sofa - it's been top of my wishlist since we visited a friends' flat a few years ago and they had a huuuge corner sofa that just looked absolutely beautiful. Whenever I mentally plan my fantasy house (which is more often than I care to admit) the living room always involves a big corner sofa covered in lots of cushions. That's the dream! I adore this grey sofa from Furniture Choice - I can just imagine B and I lounging on it, surrounded by cushions on a cosy evening. 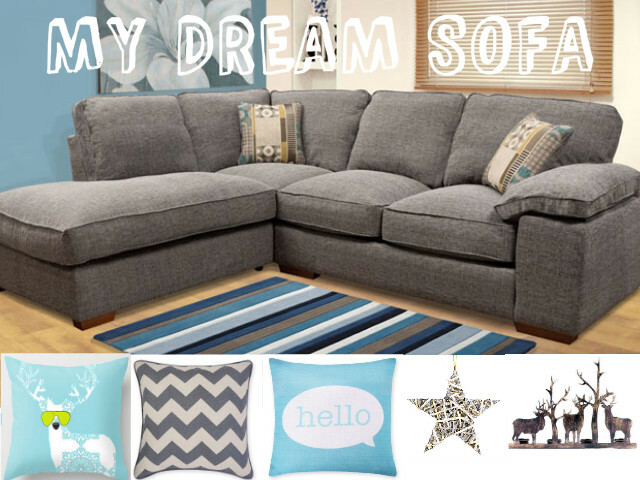 I've put together a little wishlist showing how my dream sofa would fit in my living room, incorporating a couple of festive touches in there since it is almost Christmas after all! Speaking on fantasy room planning - check out my Home Pinterest board, it's full of amazing furniture and homewares for you to swoon over and help plan your own dream home! Post written in collaboration with Furniture Choice.